In North America the Bluebird is the very appropriate English name of the familiar and favourite Sialia genus of ornithology. Withing the genus Sialia there are three different species: The Eastern Bluebird (Sialia sialis) has a chestnut throat and breast, being an abundant bird on the eastern side of the continent, appearing also in Bermuda; the Western Bluebird (Sialia mexicana) with the middle of the back and breast chestnut, taking its place further to the south and westward; and the Mountain Bluebird (Sialia currucoides) who is of a lighter hue and with no chestnut, this being the north-western form of Bluebird. The genus Sialia is one of those that are midway between the reputed Families Sylviidae (WARBLER) and Turdidae (THRUSH). The Rock Thrush (Monticola) in the Turdidae family and some others show how hard it is to maintain any valid distinction between them. 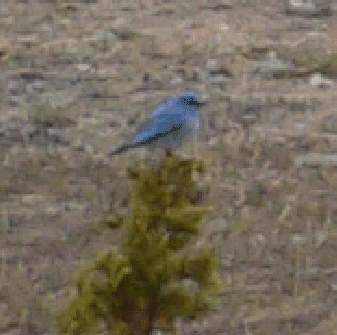 The Rock thrush for example includes a Blue Rock Thrush (Monticola solitarius), which has a similar size and shape to the bluebirds, and which breeds in open mountain areas, nesting in rocky cracks or openings, or in or walls. The Bluebirds of North America breed in holes of trees, and seem all to lay pale blue spotless eggs. In Western India, Ceylon, and Burma, the name Bluebird is equally well bestowed on the Irena puella, this being named the Asian Fairy Bluebird of modern ornithologists. According to Mr. Layard's 19 century book, Birds of South Africa, page 365, in the seas of the Cape of Good Hope, the name Bluebird is applied to a completely different kind of bird, the Sooty Albatross.